As we near the Christmas break, the Marine Dynamics Academy UK Tour is coming to an end, and heading back to Christmas in the summer sunshine! Christmas is on the Horizon! With the fall semester of our UK universities coming to a close, our tour of the UK is also finishing up. We have had an excellent time in the UK visiting students and universities across the country! For us it has been wonderful to witness the interest that students have in the diversity of the modules that we offer here at the academy as well as appreciation for the stunning wildlife that we are exposed to! We visited our final few universities last week and here we introduce a little as to what went on! Southampton University (UoS) is home to Anna one of our interns from August, and she was a big help with organising the event here at Southampton. 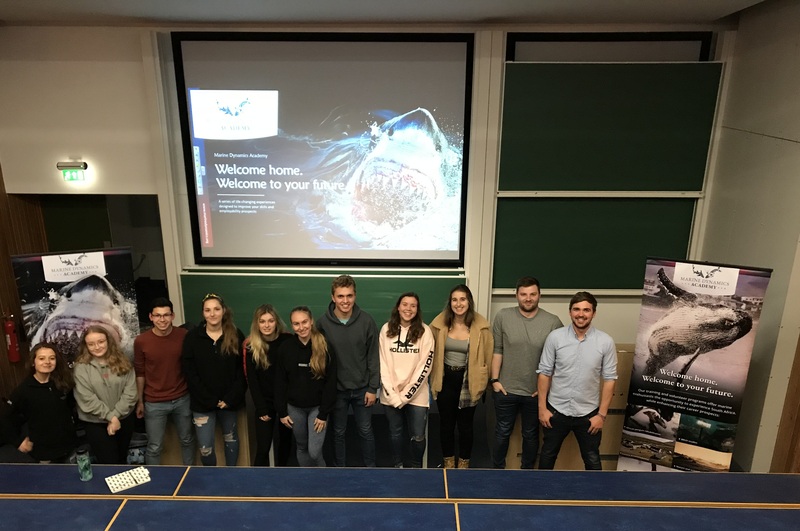 The students also received a bit of a bonus talk as well, with James Oliver a UoS MSc Researcher covering the behavioural ecology of great whites presented his finding from the study he completed with Marine Dynamics last year. After James’ excellent presentation, we were able to discuss the opportunities that the Academy has to offer Undergraduate and Masters level students that would like to develop a career in Marine Science. 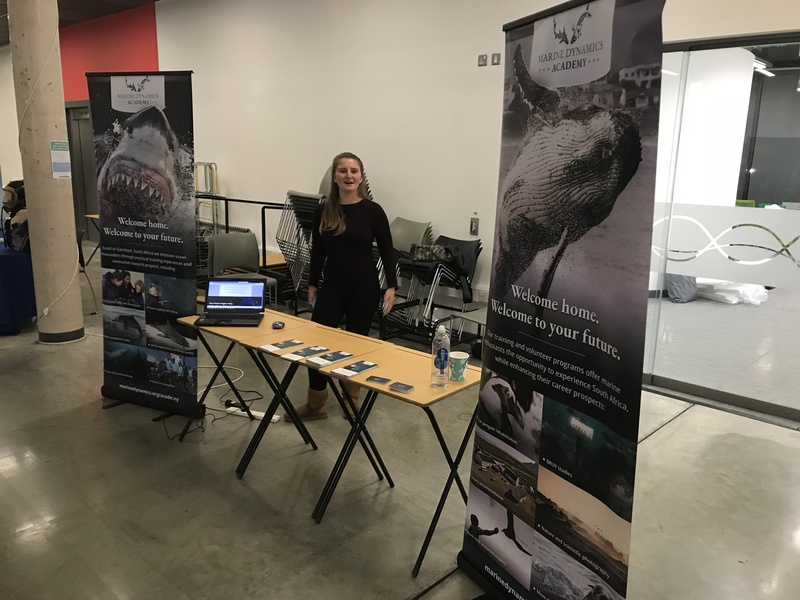 We had some excellent discussions about some of the different whale and dolphin species that we observe in the Dyer Island Ecosystem, with lots of keen students! Thanks to all of those that joined us in Southampton and Anna is there to give you guys a first hand account about her experience if you’re interested. Next up was a careers fair at Plymouth University. Here we met up with Liberty Denman, who joined us on board Marine Dynamics‘ Shark Cage Diving Vessel, Slashfin back in October. Libby is a Marine Biology student with a massive obsession with sharks (no judgement!! ), and is looking to join us again next summer to complete her student project with us. At Plymouth we were exposed to a whole host of different students ranging from Marine Geologists to Conservationist and Marine Biologists. With a fantastic turn out at the event we were able to meet some superb students! Thanks to all those in Plymouth! Our final stop on the tour was Bangor University, home to some of our current biologist team from their undergraduate and masters level study. Amongst the stunning setting in Menai Bridge, the marine science community welcomed us for a guest talk with their undergraduate and masters level students. We again had a wide range of disciplines in the audience with some excellent questions about the programme and the wildlife at the end. We also met up with future Intern at the academy Josh, which was fantastic to chat all things MDA before he joins us in July. Exposure to students directly has been wonderful over the last month of journeying up and down the UK. The diversity of different academic backgrounds has been an eye-opener for us with respect to how the Academy is able to cater for student scientists with a plethora of ambitions. While we say goodbye to the UK for now, we certainly hope to be back again in the near future, so if you’d like to see us visiting your university then get in contact and we will try our hardest to organise an event so that we can meet face to face. For now though, a huge thanks to all those that assisted with the organisation of these events, and to all those that joined us at the talks, it was a real pleasure to meet you all. I am Lead Producer for Marine Dynamics Academy. I oversee the development of our Scientific Internship and design the vast majority of our marketing.